I know we're a couple of days out, but wanted to share with you what we had for Christmas dinner. The whole family, grandparents included, took a field trip out to Marin Sun Farms the Thursday before to pick up our pre-ordered dry-aged standing rib roast. It was a beautiful drive out, we had a great lunch while at the store and took a lovely walk in downtown Pt. Reyes Station. The sunset was stunning out on Tomales Bay as we drove a little farther up to Marshall to take in the view. As it was just the 6 of us for dinner, we kept it rather simple. I didn't even do a horseradish sauce as I didn't even think of it until literally setting the meat at the table. 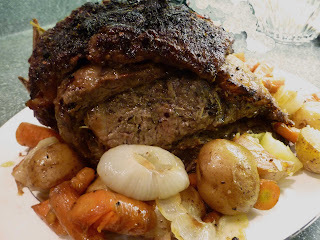 We were all so caught up in the beauty of the roast we just forgot and it really didn't matter as we all agreed it would have interfered with the taste of the meat. In fact, "Gumpa" declared it was the best piece of prime rib he had ever tasted (!) The man is 80 and has had TONS of prime rib in his life, so I was pretty pleased with myself. 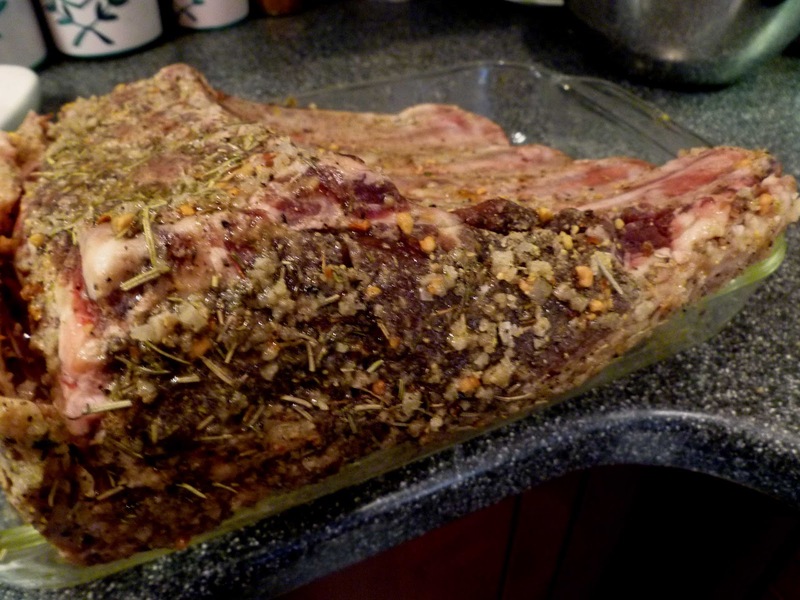 24 hours before starting the cooking process, rub roast liberally with the spice blend and refrigerate. 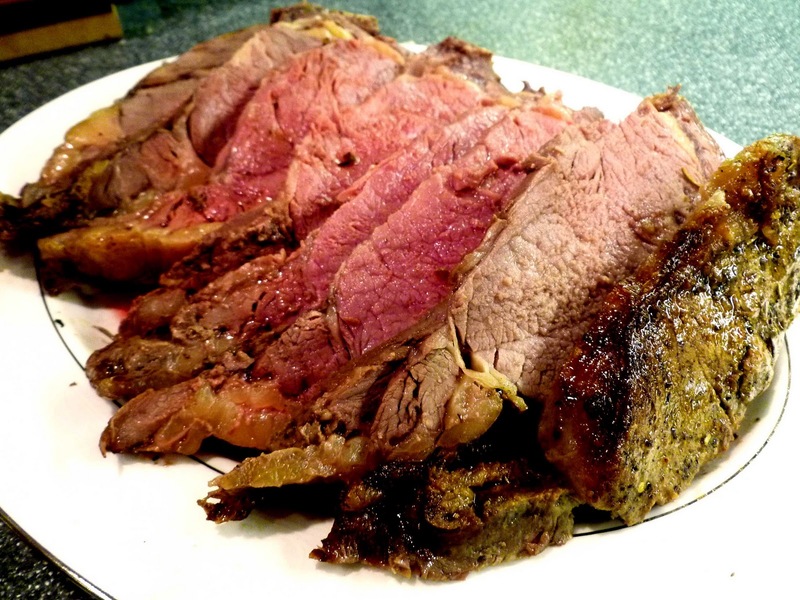 Pull the roast out of the refrigerator about 2.5 hours before you want to eat. Mostly medium, the end cuts more well done and nice and salty, with a couple of medium rare pieces toward the middle of the roast. 3 tart apples of your choice. I used 1 pink lady, 1 granny smith, and 1 fuji. I got them all from the Chinchiolo Farms stand at the farmer's market. Chop the apples into 1" chunks and squeeze the lemon over them. Add the remaining ingredients and stir to combine. Start with 1 TBSP of mayo and go from there if you need more. Add sea salt to taste. This kept for the next day, too. We had this for Christmas Eve dinner. 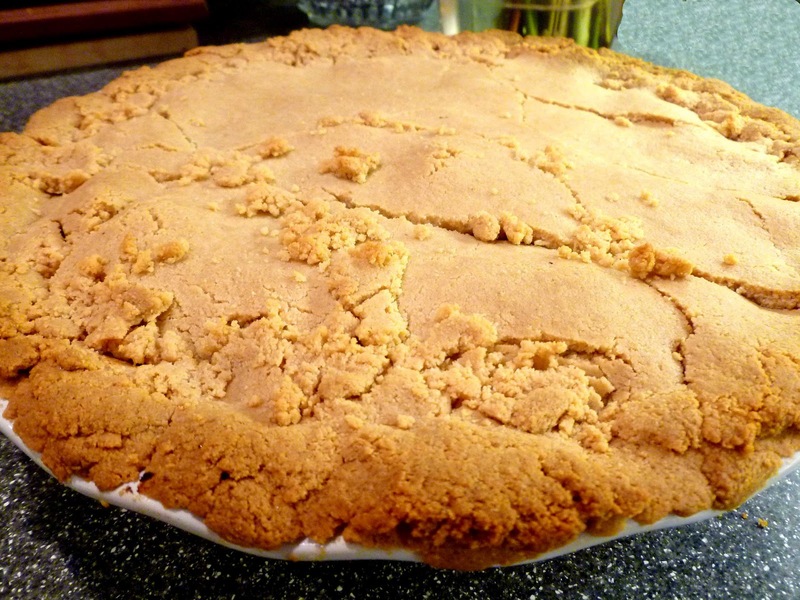 It was the first time I made it and I tried out an almond flour crust that came out pretty good. I have a few notes that will make this truly outstanding the next time out but wanted to share it with you overall as it was a nice meal for a busy evening of wrapping presents, attending service, and trying to quell the force of a 7 year old really embracing the spirit this year. 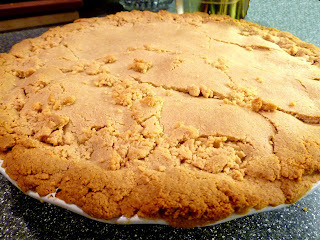 The pastry I used was this tart crust recipe from Elana's Pantry. I made three separate batches since I made a 12 inch pie with 2 lbs. 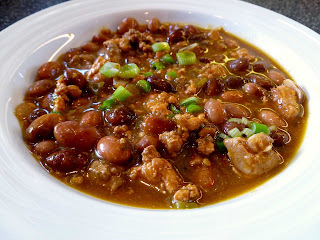 of ground pork from Prather Ranch. 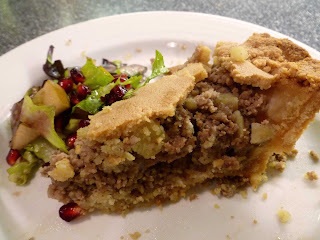 The crust held up beautifully but was a little on the thick side for the bottom of the pie. I pressed it int with my fingers but next time I'm going to try to smooth it out more using a small glass jar or something to keep it more even. I refrigerated the amount I wanted to use for the top and rolled it out between 2 sheets of wax paper. It cracked a little when I went to cover the pie, but i just put some extra bits over the cracks and it worked well. Bake the potato until done, 30 - 45 minutes in a preheated 400 degrees F (205 degrees C) oven. Peel and mash the potato, or cut into small dice. Place the potato, ground pork, onion, spices and water in a large frying pan and simmer until very thick, for about one hour. Brush with beaten egg and sprinkle with paprika, if desired. Cut steam vent. Bake for 50 minutes at 350 degrees F (175 degrees C). If edges brown too fast, cover with a strip of foil. Serve warm. 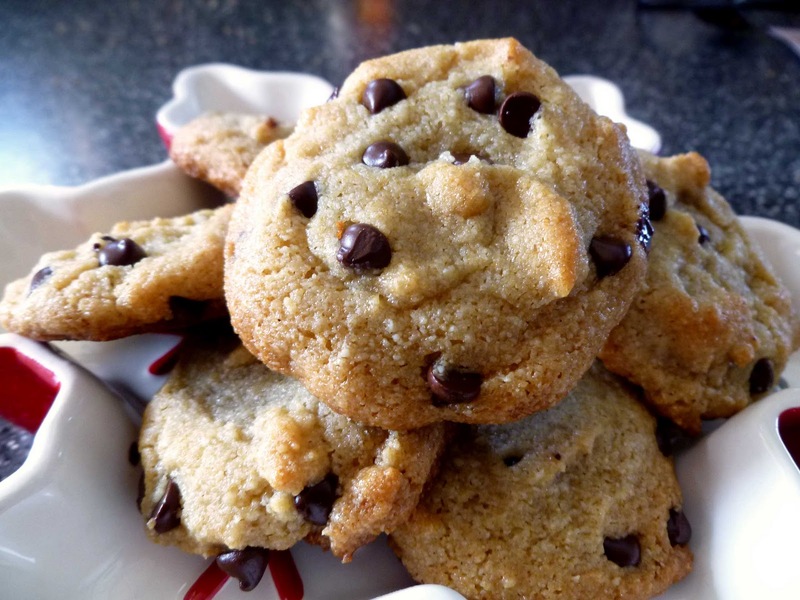 These cookies are free of most allergy triggering ingredients (except nuts). There are no eggs, grains, or dairy. 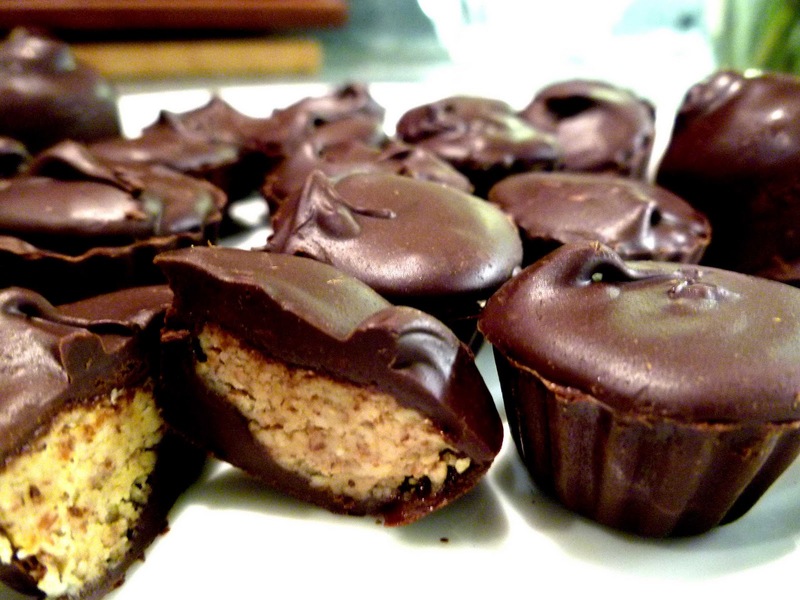 The chocolate chips are vegan and gluten free. Most importantly they taste really good, nice and chewy with just enough sweet. This is a good one to make with your kids, too. There are very few ingredients and the whole batch took 20 min. to come together. I let one child pull together the wet ingredients and one pull together the dry and they both were able put them on the cookie sheet with minimal squabbling. If you can manage to box these up before the family eats them all, they make a lovely hostess gift. I stole these directly from Elana's Pantry and changed only one thing by using organic raw almond butter versus roasted. It was gratifying to see that they came out exactly as hers did. She has a great link to how to temper chocolate properly, too. I used the "seed" method and it worked perfectly. 1 cup dark chocolate chips --I used Callebaut Dark Chocolate that I got in bulk at Whole Foods. 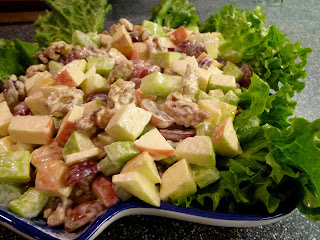 I had a fair amount of flavored nut butter left--great to dip apples in for a later day. 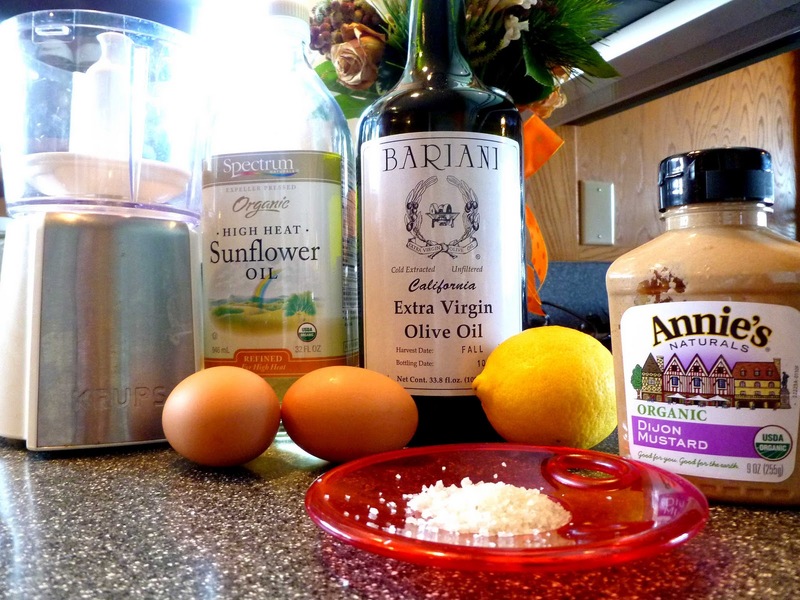 Beat egg whites with salt in a clean bowl until stiff. Slowly beat in maple syrup and vanilla. 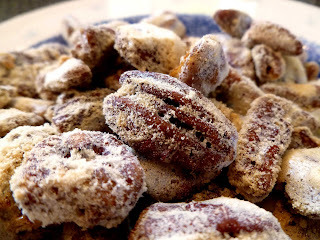 Fold in pecans until well coated. Spread on two buttered (I used coconut oil--but it still stuck to the pan), stainless steel baking pans and place in a warm oven (no more than 150--mine only goes down to 170 and it worked fine) for several hours until the egg white coating hardens. Store in an airtight container in the refrigerator. You can double this recipe too. This mayonnaise took me less time to make than it would to walk into a grocery store and find it on the shelf. Plus I didn't have to buy a product that had soy or canola products and does not suffer from pasteurization which kills the enzymes in it. Be sure you find a good source of PASTURE RAISED eggs. Just because they are organic does not mean that they were "free-range." At the supermarket, you'll start to see them more frequently in our area. They run about $7 to as much as $9 a dozen. If more of us buy them, the price will go down. I got them as low as $5.99 at Whole Foods the other day. They were from Vital Farms so not local but I felt good about buying them. A lot of chickens will stop laying eggs around this time of year, so getting them at farmers markets will start to get more difficult. When using oil, I don't recommend doing it with olive oil entirely. It'll be very strong in flavor, better to mix it with a lighter oil such as avocado oil. 2/3 cup oil of choice. I used half Extra Virgin Olive and avocado oil. Optional--1 Tbsp. whey which will extend the life of the mayo considerably--several months--as opposed to about 2 weeks if you leave it out. In a food processor place egg, egg yolk, mustard, salt and lemon juice and optional whey. Process until well blended about 30 sec. VERY slowly, add the oil while the processor is going--a micro thin stream is what you are going for. When all the oil is incorporated, check the taste--does it need more lemon? Salt? Mustard? Add it in and blend for a bit more. This whole process should not take more than 3-4 min. The mayo will be a little more liquid than you see at the market. If you put whey in it, let it sit at room temperature, well covered, for 7 hours before refrigerating. If no whey, put it into a container in the fridge right away, it will set in a few hours. It makes about a cup and a half, which we sometimes get through in 2 weeks, sometimes not. The batch pictured above turned out on the thicker side. I used only 2 egg yolks and I have an emulsifier attachment on my mini-prep food processor. If I were to do it for guests I would do the first 2 parts the night before and finish it up just before guests arrived to make the timing easier. When I made this earlier in the month, I started at 9:30 with the first part, did the 2nd at about 1:30, then started the final part at 4:30 to get the dinner on the table by 5:45 so Steve could get to a meeting at 6:30.
of the mixture already in the pan and cover with the remaining mixture. fork goes in and out easily. get going on it so I would count on refrigerating for at least 4 hours. back in the oven for another hour and a half, braising the meat at least once during the cooking time and serve. 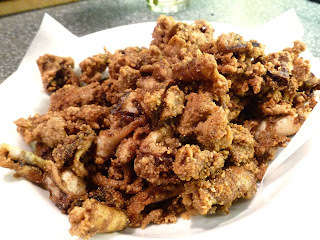 The whole family really likes fried calamari. 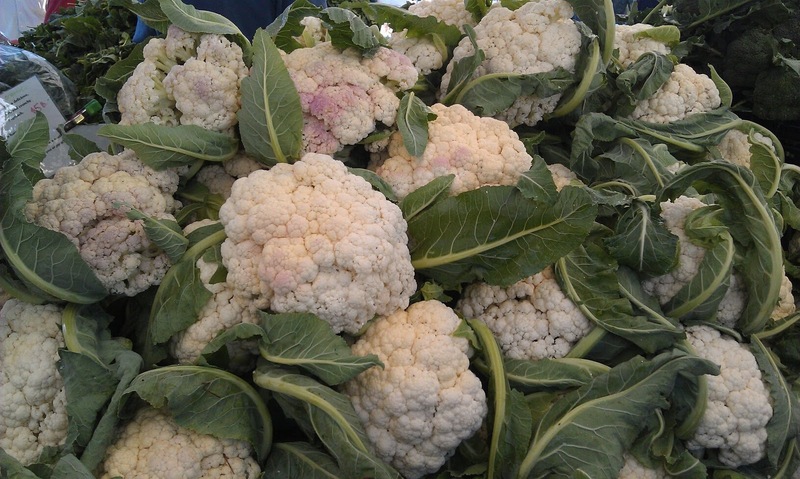 Lucky for us it's in season right now and I was able to get my Monterey calamari at Fish. in Sausalito. Check with your favorite fish monger, it's really worth it. Unfortunately, most places use dairy in their fried calamari, and then those that don't obviously use regular flour. I stole the "5 spice" part from a recipe posted on Epicurious and then modified it to suit our needs. I did make the dipping sauce, which turned out excellent, and then served it with a green salad and some very simple mashed combo sweet potato and hannah yam. I only added olive oil and salt to the mash and it turned out great as well. 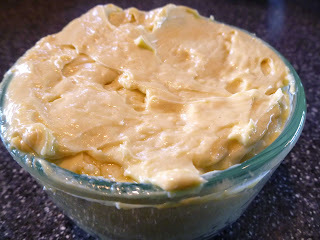 1/4 cup mayonnaise--if you can't make your own, use one without canola or soy products. Pour oil to depth of 1.5 inches in heavy large pot. Heat to 350°F. Use a candy/fry thermomater keep an eye on the temperature. Whisk next 4 ingredients in large bowl to blend. Dip the calamari in the egg wash. Working in batches, remove calamari; dredge in flour mixture, but don't let it sit in the flour, it will get goopy. Fry until just crisp, about 2 minutes. Using slotted spoon, transfer to paper-towel-lined plate to drain. Serve warm with sauce. Season with salt. I love cake. And cookies. And candy. This is in direct contradiction to achieving optimal health. But. I really like sugar. I have left it behind these past couple of weeks because of this cleanse I'm almost done with, and I'm not sure absence has made my heart grow fonder. I'm really looking forward to not loving sugar so much, as it really does nothing good for you. ANYWAY. I bake over the holidays, always have, always will. Now, however, there is a bunch of great product out there that make holiday treats a little less devastating. 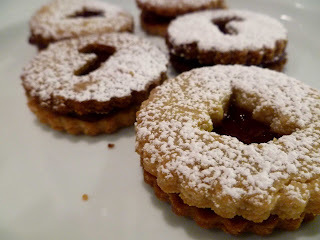 Take these Linzer Cookies. I used the recipe from Elana's Pantry. She has great sourcing information and the nice thing about this recipe is that it is ridiculously easy, with only 6 ingredients, and it looks like I'm some kind of pastry whiz. I have a couple more tricks up my sleeve this week and I'll be sure to share them with you as I turn them out. The trick to making these is to divide the dough into 4 parts; take one part of chilled dough out of the freezer at a time to roll and cut out cookies. The rest of the dough will stay cold in the freezer. Keep in mind, the dough is much easier to handle when it is chilled. Thanks to friend Curtis for posting this handy info. Although I have used canned tomatoes in the past, I'll just make do with fresh--next Fall looks like I'll be learning how to put up summer veggies. Maybe we should have a canning party? Heat a large skillet on med high and spray with cooking oil. Brown the turkey meat and chicken, in two batches if you have to. Put the meat in the crock pot. Put the remaining ingredients in the pot. Cook on high for 4 hours or low for 8. This is a great, non-ranting, concise article about GMO's. I think you should read it. Really wanted fish, so went to Fish. in Sausalito see what was what. Yes, they have gorgeous crab, but we've got a shellfish allergy in the house, so I went with the California Sturgeon at 21.99/lb. I got four 6oz. "fillets". I put that in quotes because of one of the many cool things about this fish is that it has no bones! I looked up several recipes for this fish, and decided after reading several sauces and such to make with it, I would just go old school and put a little olive oil and sea salt and pepper and grill it on my grill pan. Heat your pan to medium high then cook the fish 5 min. a side. 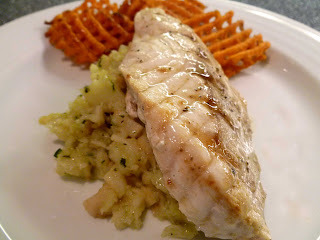 It was perfect, the kids ended splitting one fillet and that was enough for them, Steve and I were happy with one 6oz. portion each and I had the leftovers today for lunch. You can see some Sweet Potato Waffle Fries from Alexia. Peel the celery and dice into uniform size cubes about 1/2 inch. Heat about 3 TBSP. olive oil until hot but not smoking. Add the celery root and brown about 5 minutes. Add garlic and thyme and saute another 5 min. Add stock, cover, and simmer for another 20 minutes until easily pierced with a fork. Smash it up in the pan leaving it a bit chunky. Season with salt and pepper. I walked into a Walgreen's today after my workout to buy a bottle of water. At the checkout, the cashier asked me, "Do you want to buy some candy with that?" I looked at her crooked and said, "No, thank you." Alarm bells going off in every way possible in my head--which must have shown on my face, I'm a pretty easy person to read. She then says to me, in a low voice, her eyes darting to the back of the store, "It's terrible, I know, I have to ask every customer if they want candy when they check out. It's bad, right? I have to ask the parents when the children are standing right there." I told her, yes, that's too bad she had to do that and that I hoped she hung in there. The opposite of having candy with your water purchase is this salad. I tailor this to every season, keeping the kale and dressing constant and varying the bits that garnish it. 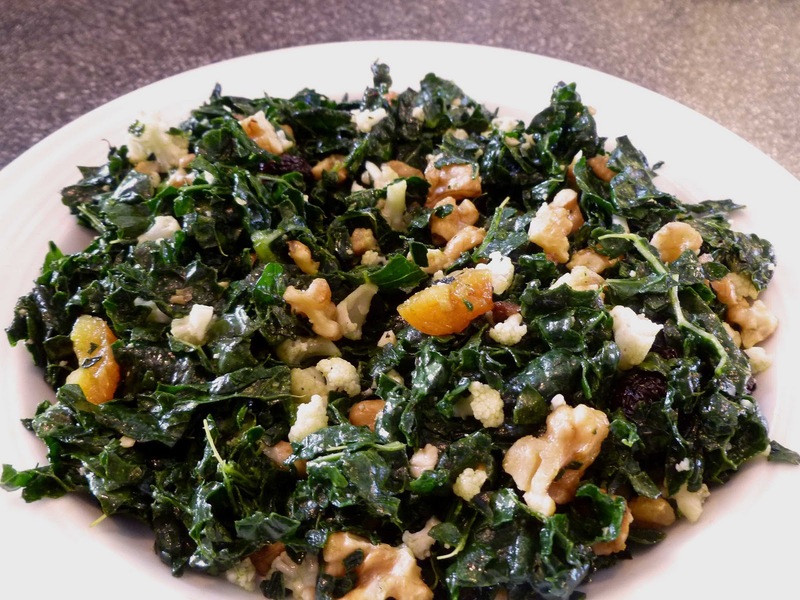 It's a raw salad, but the preparation allows the kale to get tender and very easy to eat. The best thing about eating this salad is that you feel like you are really doing something great for your body while eating it. This does take several hours to cure, so this is one you need to plan ahead on. whisk together ingredients and set aside. Wash and dry the kale. Chop it horizontally in 2 inch strips. In a large non-reactive bowl start tearing the pieces of kale down removing the thicker stems as you go. Get them down to bite sized pieces, not confetti. Do this with your hands, don't chop it. The actual action of tearing the pieces starts to release the nutrients in the kale and allows you better access to them. Squeeze the lemons over all the kale, grabbing, squeezing and tearing it for about 1 min. The color should change from a bright green to a darker green. Add the remaining ingredients, add the dressing, and toss to coat. Add a little salt and pepper to taste. Cover and refrigerate at least 6 hours. Even better overnight, but not more than 2 days. It'll get very stinky if you let it go too long. 1. Mix together flours, xanthan gum and baking powder with a whisk in a mixing bowl. 2. Add eggs, vanilla and sugar. Add milk slowly, until batter is desired thickness. Do not over-mix or batter will become thick and stiff. 3. 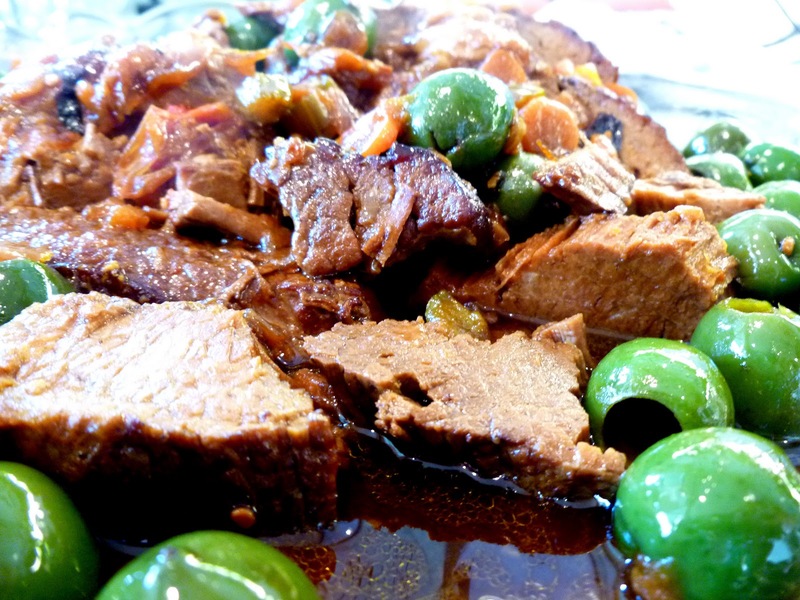 Heat oil in a heavy skillet or non-stick pan. 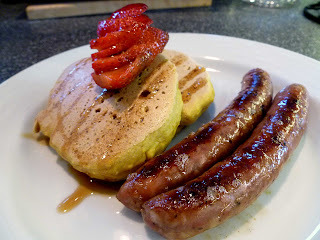 When skillet is sizzling hot, pour in batter or drop by serving spoonfuls to make pancakes. Spread batter out in pan if needed. Cook until pancakes have bubbles throughout and bottoms are lightly browned. Flip with a spatula and cook briefly until done. 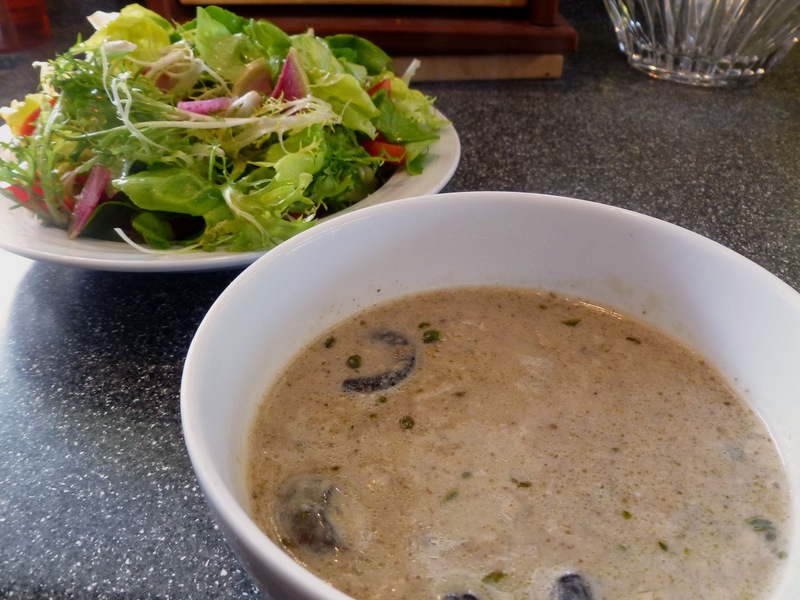 This isn't your typical "cream of mushroom" soup. It's really not particularly creamy, either--I used coconut milk instead of heavy cream--but wow, is it good! You can get creative with this one. I used mini-portobellos, oyster, and chanterelles from Solano Mushroom Farm. These mushrooms were so fresh they literally bounced on my kitchen counter when I poured them out to clean them. 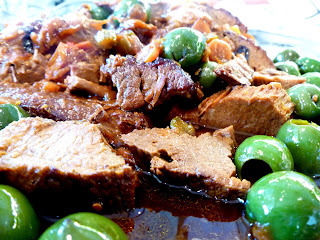 I made this with beef stock tonight, but you can use vegetable or chicken. The original recipe also called for flour as a thickener. I used arrowroot powder instead. Preheat oven to 400°F. Line 2 large baking sheets with foil. Divide mushrooms between prepared baking sheets. Drizzle mushrooms on each sheet with 3 tablespoons oil. Sprinkle generously with salt and pepper; toss to coat. Cover with foil. Bake mushrooms 30 minutes. 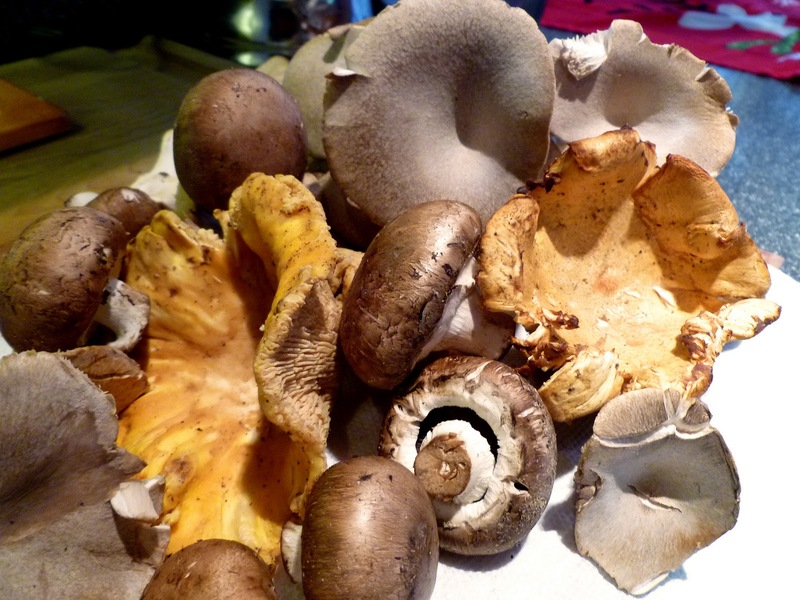 Uncover and continue baking until mushrooms are tender and still moist, about 15 minutes longer. Cool slightly. Puree half of mushrooms with 1.5 cups stock in blender until smooth. Set mushroom puree aside.